It could just be a hot day. The hotter it is outdoors, the harder your AC has to work to cool your home. Unfortunately, there’s not much we can do about outdoor temperatures. In this article, we’ll go into these 4 problems in more detail and describe how you can solve them. If you think your AC system is suffering and you need a expert HVAC technician to inspect, contact us to day to schedule an inspection. Follow these troubleshooting steps to determine if you have a thermostat problem that’s causing your AC to run non-stop. If your thermostat is set to ON instead of AUTO, your AC’s fan will run constantly. Solution: Switch your thermostat to AUTO so your AC’s fan will only run as needed. The lower your set your thermostat, the longer it will run. So if your thermostat is set too low (i.e. below 68 degrees), it may always run—especially on hot days. Solution: Try setting your thermostat to a lower temperature (70°–75°). If your filter looks like the one on the right, it’s dirty and time to change it. Long story short: Your AC needs unrestricted airflow in order to cool your home to your desired temperature. But if your air filter is dirty, it limits air from coming into your air conditioning system, which means your AC will run constantly to try to cool your home. Solution: Try replacing your filter once a month in the summer to avoid restricting airflow. If your supply vents are closed, your AC may be running constantly because it can’t supply your home with cool air. Solution: Open your supply vents and make sure nothing is blocking your return vents (like furniture or drapes). Your AC’s evaporator coil is the part of your system that removes the heat from your home’s warm air. If your evaporator coil is dirty, then it can’t properly remove the heat from the air, which makes your AC run for a longer time. Solution: Have an AC professional inspect your system to see if your evaporator coil is dirty. 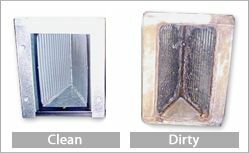 The technician can safely remove any debris and dust without damaging the evaporator coils. If your home has leaky ductwork, then cooled, conditioned air that’s meant for your home will escape into warm areas like attics or walls. These leaks make it harder for your AC to deliver cool air into your home. Since the inside of your home won’t reach the right temperature because of leaks, your system will run continuously trying to cool your house down. Solution: Contact an HVAC professional to inspect and repair your ductwork for leaks. According to Energy Star, a typical home loses 20–30% of air that moves through the duct system to leaks or poor connections. Your AC’s refrigerant is the liquid/gas that takes the heat from your home’s warm air and moves it outside. That’s essentially how your home gets cooled. So if you have low refrigerant (almost always caused by a leak), your system will have to work much harder to cool your home, which means it’ll run longer than usual. Solution: Contact a professional to locate and fix any refrigerant leaks. How Often Does an AC Need More Refrigerant? Did you just get a new air conditioner? If so, it could have been sized incorrectly. Air conditioners need to be the right size (not too big, not too small) to properly cool your home. If your system is too small, it’ll struggle to cool your home, which is why it’s constantly running. Solution: Contact an AC expert to perform a Manual J Heat Load calculation, which is the method professionals use to accurately size an air conditioner. Beware of technicians who use “rule-of-thumb” estimates (like simply looking at your home’s square footage) to calculate AC size. Red Cap Air can help. Give us a call or send us a message. We’ll get your AC working again in no time so it won’t run constantly and drain energy.